Open the file called Add Events.xlsm from the folder shown above. Your task is to write code which adds a new record to the WorldEvents Access database in the same folder using the details written into the worksheet. You may have a different opinion of what constitutes an important event! In the VBE set a reference to the Microsoft ActiveX Data Objects 6.1 Library. You'll need to change the folder path to point to the correct database. Add a variable which can hold a reference to a new Recordset object. Use the AddNew method to add a record to the Event table of the database. You'll need to change the LockType property of the recordset so that it isn't read-only. The basic syntax to populate a field is shown here. Don't forget to update the recordset and then close both it and the connection. Attach the subroutine that you've written to the button on the worksheet and then test that it works. 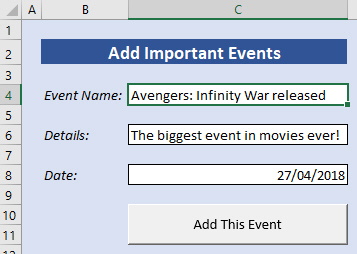 Open the Event table by double-clicking its name.